In The Lion, the Witch and the Wardrobe, by C.S Lewis, there are four children named Susan, Peter, Edmund and Lucy. They discover a magical world named Narnia. Lucy has went there, but her siblings don’t believe her about that. But one day, Edmund got sucked in. Currently the White Witch, who has now taken control of Narnia, has bewitched Edmund by feeding him magical Turkish Delight which makes him always want more of it. Then the White Witch told him to betray his siblings by bringing them to Narnia. So, when Edmund got back, he lied to his siblings and told them that he’d never went to Narnia even though he had, just to spite Lucy who’d seen him and wanted him to tell his siblings. So when the siblings found out, they got really mad at Edmund and made Lucy the leader of the expedition in Narnia which made Edmund very annoyed. I think that maybe Edmund’s spot in the family turned him spiteful. Maybe all Edmund wanted to do was become a leader because he doesn’t like to listen to other people, but as he’s the middle child, he can’t. For example, Susan and Peter, as the eldest kids, make all the decisions, like decided who would lead an expedition in Narnia, and Lucy, as the little one, is sort of babied and humored and people listen to her, not in that much of a respectful way, but to make her feel better. For example, Peter, Susan and Edmund checked out the wardrobe the first time Lucy went in just to see what she was talking about. They didn’t think anything would be inside but they did it to humor her, which they never did to Edmund. But Edmund doesn’t get to make decisions, nor does he get Lucy’s treatment because he’s too old. That’s why no one ever listens to him, so he became spiteful so that some people would actually give him the attention that he yearns for. Also, now that he’s under the witch’s spell, he’ll do anything to get Turkish delight, so if he betrays his siblings, it’s not exactly all his fault. It might have been his fault for trusting the witch but betraying his siblings wouldn’t really be his fault. Additionally, his siblings aren’t really helping him deal with his problem: they’re just shunning him. Peter made Lucy the leader of their expedition in Narnia, which they knew would make Edmund mad. In fact, they did it because of that. If they hadn’t and maybe talked things out, then maybe Edmund might have confessed about the White Witch and they could have helped Edmund. In addition, they aren’t thinking about why Edmund was spiteful, so they aren’t thinking about his feelings, only why he lied. They’re not thinking about what he might have went through in Narnia which isn’t fair because he became bewitched, even though he doesn’t know it, while Lucy instead had a marvelous time. This is why I think Edmund is spiteful. Clearly, it isn’t all his fault though possibly some negative character traits that he had might have made his spitefulness greater than it would have needed to be. The second part of Capstone has begun! But it wasn’t as easy as it would seem. We had to conference with our teachers, deal with rejected ideas and think up of questions from scratch! But that was only the start of it. For my main question, I chose to do research on if the Spartans helped build up the Greek empire or just made more problems along the way, or if they did both and how. The question I wanted to research at the start was to see why Spartans were always portrayed as vicious and brutal characters and if this was even true. If this was my main question, my sub-questions would have been to learn about schooling and to see if the subjects that kids were taught made them like that, or if it was their geological place in the world. My second choice was the question that I actually chose. When I conferenced with Mrs. Cooper, she said that my first choice might have been a bit too broad, but she said that my second question would be nice. So that’s the one I chose to research. In truth, I was a bit disappointed with what Mrs. Cooper said because I was really looking forward to my first choice. But when I started to think of sub-questions, I realized that this new question was definitely better. For my sub-questions, I wanted to see how Sparta helped or didn’t help Greece’s empire. But I wanted 6 sub-questions. After my first four, I had a big writer’s block. This was because I wanted good questions, not easy ones. And I wanted questions that would relate to my topic in a good way, not just bad ones that would be bumps in a road. Soon, I got 6 questions. But there were still problems! Most questions I thought up of started with ‘did.’ My teacher said that these would be too easy to answer, even though I totally disagreed! I loved all my questions. So I had to reword just about all of them, which made me really angry and just felt pointless to me. How did Sparta contribute to the the successes and downfall of the Greek empire? Sub Question #1 What is/was Sparta and where was it, how strong was its armies, what rules/beliefs were important to them and what was Sparta’s code of honor? Sub Question #2 Did Sparta’s love for war, blood and theft come in the way of Greece’s harmony and cause unwanted problems? How did important Greek leaders feel about this? Bonus: And did Greece help Sparta right back when it needed help in battling armies? Sub Question #5 Did Sparta’s independence raise fears about the fact that Sparta might split up from Greece or rage war on the country? How did leaders deal with this? Sub Question #6 Did Sparta depend too much on Greece and cause problems in how the country was run? How did leaders deal with this? I was really proud of this chart. A lot of work had gone into making it into what it was. My favorite questions were the last two. They were opposites, and it would be one or the other. I kind of liked that, because I could compare and contrast, and no matter what, one of the questions would turn out to be true. The hardest question was the first one. Mrs. Cooper told me to add that one because no one knew what Sparta was. But I thought it was a bad sub-question. For a long time, the question remained, ‘What was Sparta.’ Then I added the rest and the stuff about the army and I started to like the question. Before, it was boring. Then, I made it interesting. I’m happy I did that. My easiest sub-question was the second one. I knew Sparta was a country known for its strength, so it obviously waged wars with other countries. So all I did was think about it and then form it into a sub-question. I liked all my sub-questions, I didn’t dislike any. So my sub-questions were a success, though there were some challenges. And my main inquiry question was also a success. So, overall, I enjoyed this process. The question finding was fun. I hope that the rest of Capstone is fun too. Capstone is something that all the fifth graders at Heathcote School complete. In this, a student chooses a topic he/she is interested in and then researches a question relating to the topic. Capstone involves interviews, sight visits and 6-8 weeks of continuous toil and research. For me, choosing the topic was fairly simple. Ever since third grade, when I read the Percy Jackson series, I have been interested in Ancient Greece. I pride myself on knowing many of their gods which I learned from different books. But I didn’t know too much about life as a Greek citizen. So I wanted to learn about that. Yet when I talked to my teacher about this, she said it was a bit broad so I decided to research Sparta, an ancient Greek state known for its strength and army, which was said to never question orders. Mrs. Cooper, my teacher had us answer a question sheet which could help us find our topic, such as what field trips we would like to go on or what books we liked to read. For me, this was a bit pointless as I already knew what I wanted to do. But the questions asked about certain areas of expertise and what we enjoyed studying about. What was interesting though, was that I changed my second choice after answering the questions from horses to the Ancient Incas. I realized that the Ancient Incas were an interesting civilization and it might be fun to research how scientists recovered their remnants and crafted together hypotheses from those. The only thing I am worried about with my topic, Greece, is that I might get a bit bored if I read the really long novels about every little detail in Greece. Also, there are tons of different sights in which different information is displayed. I might get confused if every source says something different. Other than that, I am excited for Capstone. I really think that Ancient Greece will be an interesting topic to study. I think that a social issue that kids these days face is peer pressure. I feel like this is a really important issue when it comes to problems because it’s a lot like bullying, except you’re bullied by your friends. Peer pressure and bullying are very similar. Just like bullying, it’s hard to stand up to your friends, to say ‘no.’ And also, peer pressure makes it harder to stand up too, because you’re scared that your friends won’t like you if you stand up to them. In bullying, victims don’t necessarily care about how the bully thinks about them. Sure, it’s still hard to stand up too, but that’s the same in peer pressure. They’re very similar, except people don’t think peer pressure to be as big an issue as bullying. It often gets overlooked, though it’s just as important a matter. In addition, as similar to bullying, when pressured by peers you are forced to do things against your will. Kids who give in to peer pressure probably heer a nagging voice in the back of their heads saying this isn’t right. I shouldn’t do it. But they ignore it. So they go against their wills. They might start thinking thoughts that aren’t their own, such as should I drink more wine or should I stay up past 2. Kids don’t realize how their friends are giving them bad advice, so they simply follow it. T After all, that is easier. Their own thoughts get jumbled, which definitely isn’t good. Finally, if experiencing peer pressure, you are pressured to do something that isn’t right, like drink wine at 16 or wear inappropriate clothing.Usually, for giving in, you experience trouble from parents and teachers, maybe even the police if you do something as bad as steal. Sometimes, the friend who was pressuring you escapes while you take the blame. You can almost always expect trouble from giving in to peer pressure, even if it isn’t your fault. I think that peer pressure is more of an issue today than it used to be because now, kids are getting more rebellious and new inappropriate fads are coming in. Such as the fact that a while ago, wine was outlawed for everybody and making out in public was considered really bad. Also, children are more likely to experience peer pressure as they got older because that’s when kids discover their rebellious nature. For example, kids in kindergarten don’t worry too much about peer pressure, while kids in high school do. This is why I think that peer pressure is an important issue to be addressed. Because when people are bullied by those whom they call friends, things won’t be good for them. On February 6, 2018, the most powerful rocket of the decade was launched. It was named the Falcon Heavy. Space X, a company started by a business man named Elon Musk launched it. The Falcon Heavy was a reused rocket – the first rocket to do so. The price was only $90 million, which may seem like a lot, but isn’t, when talking rocketry. That’s why reused rockets can be so important. They cost less. Many believed that we were being held back by the cost of exploring space. But now, we are not. Who knows what reused rockets can end up doing. In addition, the Falcon Heavy was the first rocket that tried to leave orbit which was not designed by the government. Space X was run by a businessman – unlike NASA, which is run by the government. Also, the amount of technology used in the Falcon Heavy was remarkable. Elon Musk himself had some nightmare case scenarios about what would go wrong. It’s very surprising that noting did. Finally, the Falcon Heavy rekindled some of the feeling people have had about space. It rekindled excitement, hope. old dreams. The Falcon Heavy was definitely a remarkable rocket by many standards. My first reaction when seeing the Falcon Heavy was “Whoa. What is that?” Then, when I learned about all the things above, I was surprised and amazed. I’ve always been interested in space, but this was awesome. A rocket that had so many ‘firsts’ piled up on it. With so many dreams. With so many things that could go wrong. That rocket went up. I just found that amazing and really, really cool. You definitely don’t see a rocket like the Falcon Heavy everyday. But what I found most amazing was the fact that the Falcon Heavy was a reused rocket. Now, the cost was so much less. That could evolutionize space travel. Take it to a whole new level. That was just what really shocked me. I’m still wondering about the feelings that Elon Musk had when the Falcon Heavy nailed it’s maiden flight. What did he do? How did he feel? I’m also wondering about the challenges that the people building the Falcon X faced. What didn’t work? How did they feel? What did they do too insure success? These were my wondering for the Falcon Heavy. The Falcon Heavy was definitely an astonishing rocket. It held the hopes and dreams of many, and completed all of those too. It was definitely something that the U.S.A should be proud of. And who knows. Maybe this rocket will change the future. All we know for now is that the Falcon Heavy was amazing, breath-taking, and a dream come true for many. No matter what you do, you almost always have too have a reflection. Sometimes you don’t write it down, but you always have one. My Rube Goldberg project was held off for a while. I couldn’t find time too video. But on the Super Bowl I did, and it felt amazing. My reflection started at night, when I was in bed. The first lesson I learned was that it’s better to work on something for a few minutes than too not work on it at all. Just never hold it off till the last moment. I sort of held my project off till the last minute. I had a safety video, something I use in case my project doesn’t turn out, but my safety video wasn’t that good. So, never hold anything off till the last minute. Always work on it as much as you can. Also, you have too be kind too those who help you. Many times I was mean too my sister. She always helped me. But one day, she stopped. She told me too do it myself. I wasn’t being nice too her and that was my fault. So when she left, I deserved it. Maybe if I hadn’t been so despicable, she would have stayed with me. Finally, I learned you’ve gotta believe in yourself the whole way through. When I looked over my machine, a little after the final video, I noticed a couple of things that were wrong. 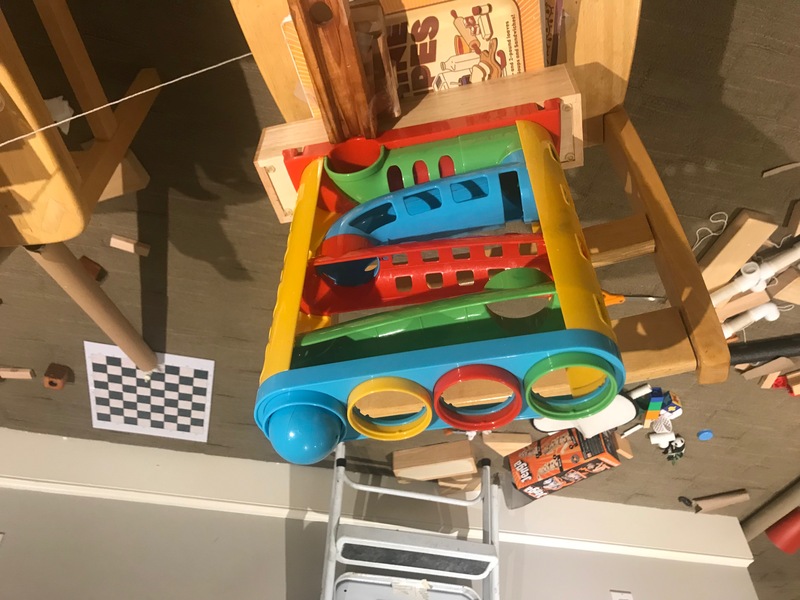 Sometimes a piece was not straight or a ball was too heavy. Maybe if I hadn’t been so stressed, I could’ve noticed these and made my project more successful. Maybe if I thought that I could’ve done a good job, I would have without all the stress that cam with it. This is what I learned. Of course, I learned some other lessons, such as the fact that things must always be labelled and the importance of a plan, but these were the big ones. Yet most of all, I learned that the fun comes in the journey. Sometimes it’s better to have fun than too complete the grade. And if you don’t have fun in a project, than it’s basically a waste. And I know I had fun in this project. Now, in the end, I don’t even care about the grade. I had fun, I think I did a great job, and I think it was a success, and that should be enough for everyone. Because I know it’s enough for me. And that is what I call a success. It worked! It worked! It really did! Nothing went wrong! The pipes worked, as did the seesaws and the tunnels. Every single part of machinery operated just as it should have and put on a miraculous show. And it was easy! I’d gotten sick on Monday, January 29th, so I worked that day and the next on my project. Due to the the deadline was speedily approaching, I had to take out a step. 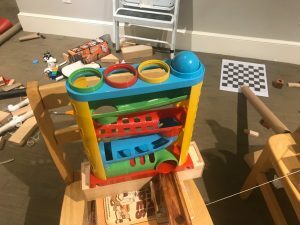 I had found this lovely old Rube Goldberg machine that I had to put together. It gave me about five or six extra steps, but it kept falling apart. 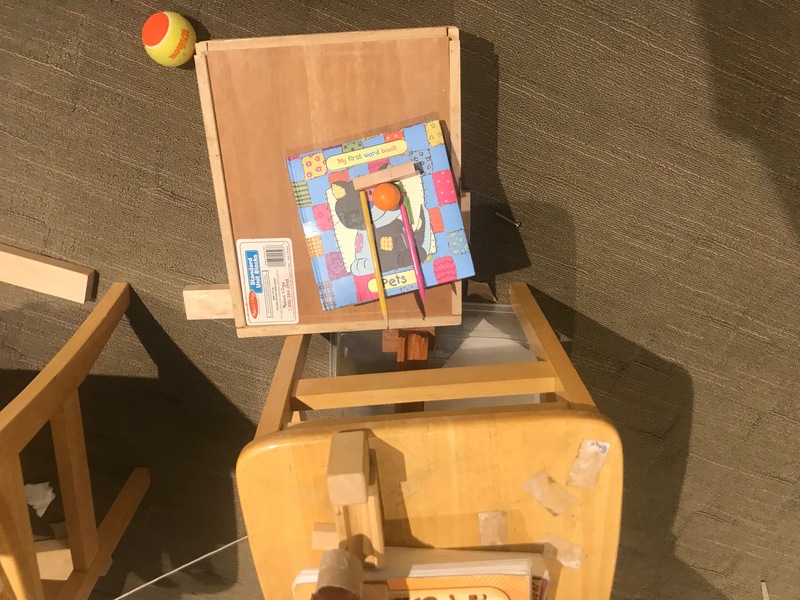 The tunnel that held the basketball collapsed, and the bowling pin, which was supposed too knock over like a domino and pull down a hammer wouldn’t balance on top of the hockey stick. So I had to cut it. It was very disappointing; I had worked extremely hard over every part of the machine, especially that one. 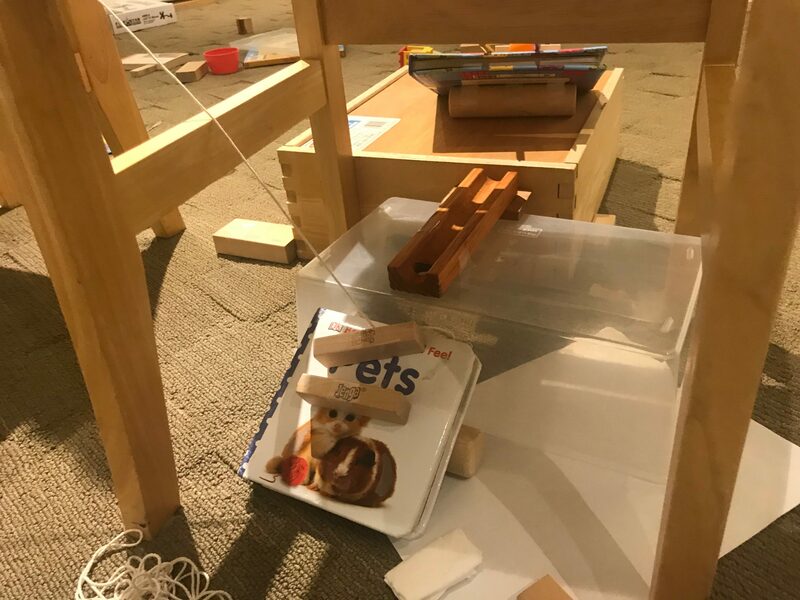 The rules my teacher had sent out for us were that we needed a video in which the Rube Goldberg machine which we had worked on completed its task. It seemed simple at first, but the video turned out to be impossible. I couldn’t video over the week; my schedule was packed. And Friday I was feeling extremely weak, as I was on Saturday too. So all of Sunday I worked. On the day of the Super Bowl! My whole family was busy so I didn’t get much done. Luckily, we watched the Super Bowl in the same area that I worked on my Rube Goldberg project in so at that time, I worked. Every second I could, I worked on Rube Goldberg. I popped my head in between rooms every time the Eagles won a touchdown and while the Patriots got the ball, I videoed. But every time I videoed, there was a step that failed. And whenever I tested, without the camera to fix something, the machine worked perfectly. I was really getting stressed. I was sweating, screaming, and crying. One time, my machine worked all the way too the second last step. And when that happened I just lost it. My screaming woke up my baby brother and then I started to wail. I was that stressed and tired. So for about half an hour, I watched the game. Then, once I was calm, I went back to the project. My sister was there, as was my dad. It still wasn’t working. My sister’s phone’s battery started to run low. My dad told me that if I didn’t finish fast, my baby brother would come back down. I had about five minutes, TV blaring, and a phone with 4% left. A couple of changes were made. Fail! The phone was at 1%. “One more video.” My sister warned. “Then we’re all out. My heart wasn’t in it anymore. “Wait.” My sister called. “Do this really quickly. It might help the machine.” We taped a tube and a block down too the board, hoping it would stop the ball from moving till the time came. There were 5 minutes till the first quarter of the Super Bowl was over. The Patriots and Eagles were neck and neck. I was going as hard as I could, neck and neck with the machine. “Now or never.” I pushed down the ball. It traveled down, and pushed the marble. The block fell, the string was jerked. The pipes were perfect, but there was one last step. 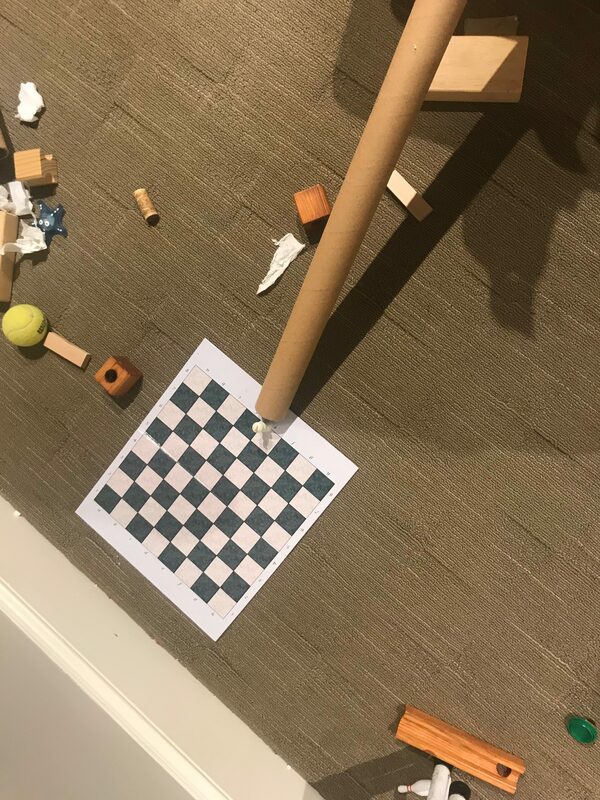 If the ball missed the chess piece, it was all over. 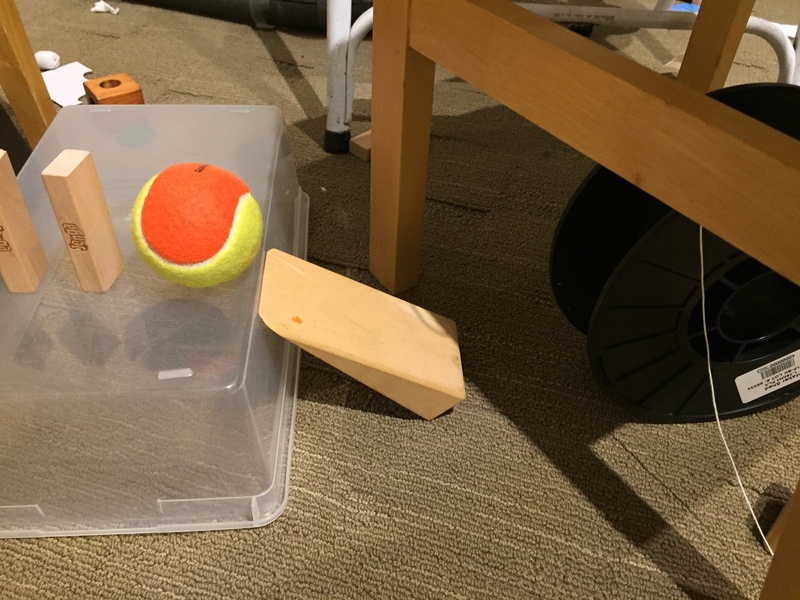 3… The ball traveled down the ramp. 2… The ball was inches from the piece. IT KNOCKED OVER! THE BALL KNOCKED OVER THE CHESS PIECE! I screamed and shouted. The first quarter was over, and so was my project. I ran around the house, drunken with joy. My baby brother was spooked, but I didn’t care. It was an amazing moment. I enjoyed the rest of the Super Bowl. My team won, but it couldn’t make me any happier than I already was. I’d reached the max in my happiness levels. Now my meter would just keep climbing. In my success, I must thank one person especially. Of course, I must thank my mom for blocking my brother from my Rube Goldberg area most of the time. My grandma for supporting me. My friends for their kindness. My father for helping me in my moments of need. But most of all, I have to thank my sister. She missed a quarter of her Super Bowl for me. She helped me, did a ton of work, and comforted me so much. She videoed for me over fifty times. If she didn’t get the credit she deserved, I would be a horrible, horrible person. This project was so important. It will stay with me for a long. But I now that one thing was definitely true, proven by this project. In failure there is now gain, only memories of what could have happened. In success there is a truth that comes out. Many things are great, but can be short lived. Revenge will always be sweet, but success is sweeter. This is my first stage of my Rube Goldberg project. 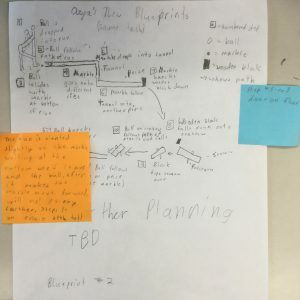 I’ve broken the whole project into stages to make organization a little easier. Each stage involves approximately four steps. This is my second stage. It is taken from an above view, so you are looking down on it. This is my third stage. This is my fourth stage. It is taken on an entirely different surface and the string attached too the Jenga block here is the same one you see in the third stage. This is my fifth and final stage. In it, the little speck at the bottom is the chess piece which the marble knocks over. From the start, when my teacher first announced that we would do this project, I’d had a problem. My schedule was so packed, that I wondered if I’d ever be able to work on my project. Due to this unfortunate dilemma, I was only able to work on this project on the weekends. And there were only about 4 weekends in which I could work on this project. That was my first problem. My second was that I had a baby brother who destroyed my project twice. And third, was that I needed materials, which I could not easily find anywhere. I had a whole list of problems that kept on going. Luckily, every problem was solved, some of them not as simply as others. But they were all solved, and soon, my list of problems got very short. By January 19, I was almost done with my project. The best part was, I had till February 8th to turn it in! That was 20 days, or roughly 3 weeks. All I had to so now, was videotape the project. I didn’t realize how hard that would be till I actually started. One of my most complicated steps occurs when Jenga pieces knock into a ball which then knocks into a wheel. 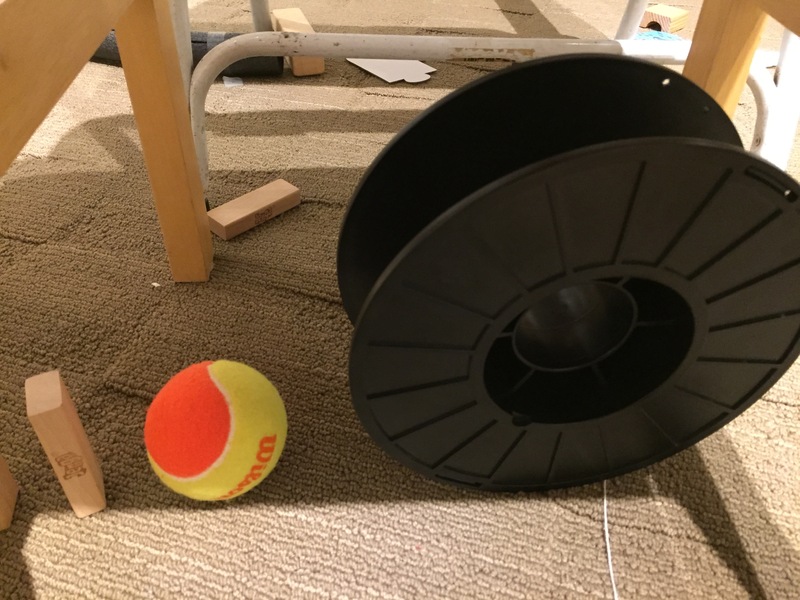 That wheel is supposed to go under a chair and yank a Jenga piece off from on top of the chair and, as a result, let a marble travel down a path. But the wheel didn’t move enough when knocked into. So the Jenga piece didn’t budge. This was very frustrated. Finally, after a whole weekend passed, I found a solution. This solution came when I mounted the wheel on top of a small block so it could go down a ramp and gain more speed. But even after that, while recording, the wheel didn’t go down the ramp, or the ramp blocked the ball from knocking into the wheel. Once I found the solution to this, which was getting a different ramp that was a bit flatter, I realized the importance of having a plan to look at. Even after this, about 2 days later. I scrapped this whole step and replaced it with a sea saw, I still wished I had a plan too look at. Because by then, I definitely wasted that I hadn’t spent so much time worrying on this. Many other last minute problems popped up. The one above was definitely more complicated, but the others were challenging nevertheless. Yet I found out that every time a problem came up, I found a quick solution to it if I just focused. My whole experience when making last minute edits taught me that you have to look over a machine a lot. Twice or three times at a minimum. Because otherwise, you won’t be prepared to start the next step. And there’s never a point to do anything in life if you aren’t prepared for it. This photo shows the step with the wheel that I was having a problem with. This is step one, where nothing has changed. This is step three. It is a video. In this, I drop the ball onto the sea saw too show what will happen. My goal is for the ball to fall on the sea saw and yank the string. To work this, first press the link. Only do it once or the video will download too many times. The video will automatically download onto your computer. Click on it and watch it. Then, go too chrome://downloads to delete the video. Many times when I made the Rube Goldberg project, I felt nervous that I would fail. One time, I got so nervous, I just wasn’t able to work. Looking back, I don’t know why I was scared. I mean, I was doing pretty well when it came to my progress rate. But I guess that just happens when you only work on a machine in your own time. My sister once suggested an awesome idea. She told me to make a safety video. This would consist of a Rube Goldberg machine that was pretty lame. It had about 9-10 steps which I stretched out to make them look like they were elaborate. It would reach the ‘okay’ standards, but nothing more. At first I ignored this. I was pretty confident. But once I started getting stressed out, I listened. Quickly, I used the steps which I had made. My sister and I jazzed them up a notch and then we added a chess piece at the end of the machine. And believe it or not, the machine functioned properly after a few tries. Even now though, when my machine was so simple, there where a lot of problems. The biggest one was having to line stuff up. I had a marble which dropped through a tunnel. But, if not lined up, the marble stopped when the tunnel finished. My solution to that, was marking. I made a black line where everything was to go so I wouldn’t forget. My sister jazzed up the video, while I worked on another blueprint which showed the changes to the machine which we had made. The idea which my sister had proposed worked great. The one problem that came with it was that I started to get a little lazier when it came too the project after that. This problem was solved later, after I noticed that I was falling behind. 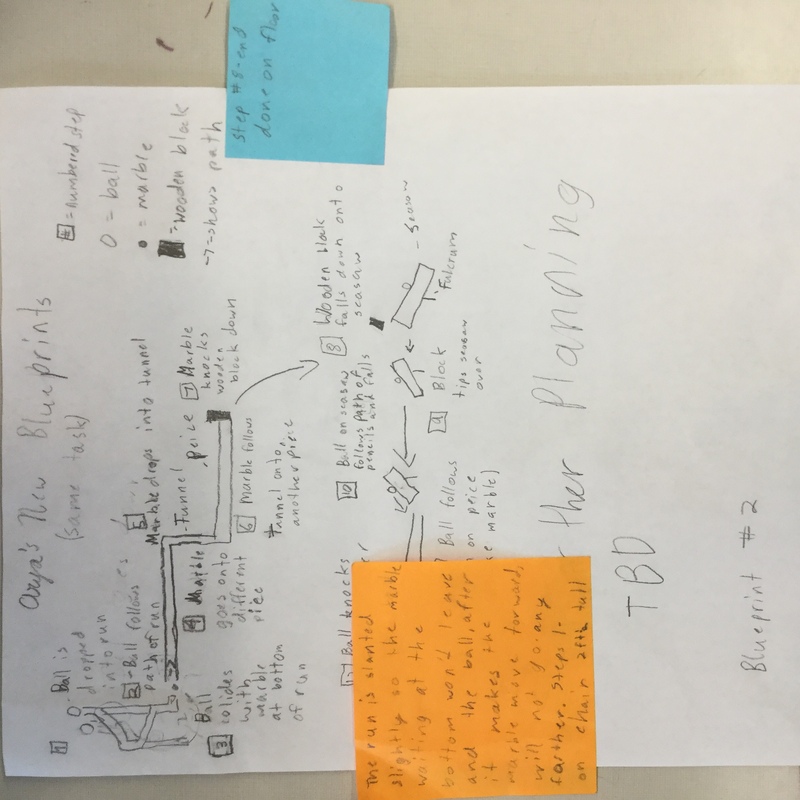 I turned the blueprint in the next day, knowing that I probably would not use it. But, if worse came to worse, at least I had a good video. This is my safety video. Due to technicalities, the video downloads when you press this link. Once it downloads, just click the part where the video is shown, and then it will play. After that, you may delete it by seeing all the downloads (chrome://downloads) and pressing the ‘x.’ Remember not too click the link too many times, or it will download too much. This is my blueprint which I made that supports my video. Any time you do something, whether it’s a book or a machine, you always have to edit it. Otherwise it’s not going to reach the level of capability that it was made for. Because of this, I made sure to edit my Rube Goldberg machine. I had about 11 steps. But for some reason I just wasn’t that glad with what I had. It was extremely simple. Nothing like a proper Rube Goldberg machine. I had only used two of six simple machines, and hadn’t even completed my goal of using 4. It didn’t feel good at all, even though I had completed a task. Also, my machine was just too fragile. My baby brother constantly came too my work space and bulldozed it. I reboarded my train of thought. What could I change? What did I not like? What could be made more complicated? It didn’t come too me immediately. I had too sit and think for while. First I changed the ending. Instead of a ball barreling into a chess pace, I made it go down a ginormous tunnel. Then I made a line of dominoes which it would crash into. For about an hour and a half I was pondering about a bunch of different steps. 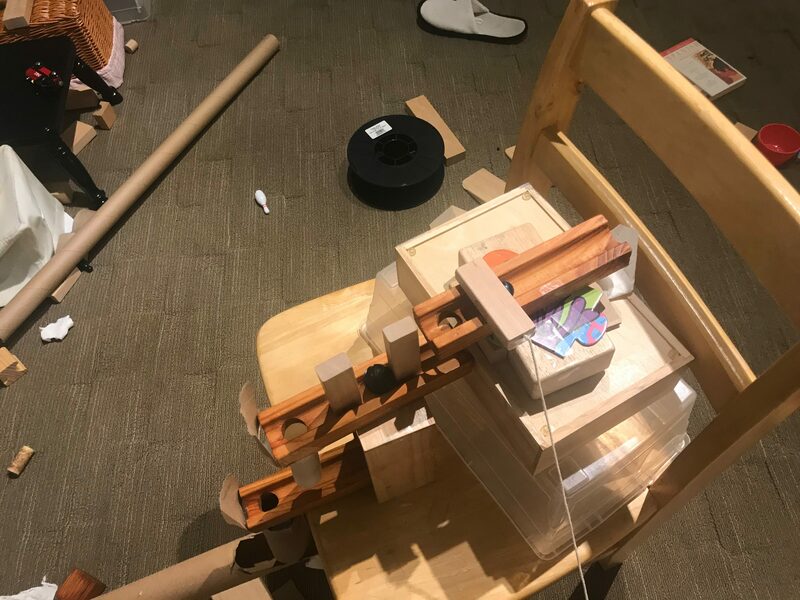 When I finished, my Rube Goldberg project looked like it was finally going somewhere great. It was actually starting to look like a big, complicated, over engineered machine. I’d had to redo the whole machine, but it was worth it. This incident taught me the importance of planning ahead and sometimes just stopping to think. Now, if I come across a problem, I know what to do or how to find a solution if I’m stuck. After a little bit of thinking, I was able to come up with a solution and many more. This was an important experience for me that really helped with my success rates during this project. The link above shows what my Rube Goldberg machine looked like right before this stage happened. This link above downloads my video to your screen. It will take about 3-5 seconds. The download will appear at the bottom of your screen. Click it, and it will play for you. After that, go too downloads, (chrome:downloads) and it will delete it you press the “x” on it. The video below is something that helped me when I was brainstorming different ways to make my project have more steps.